We know every household is different, that’s why we’ve put together four amazing packages to suit everyone's needs. From surfing the net on the sofa to binge-watching the latest box set, streaming music with friends to ruling the galaxy in the latest must-have game - we’ve got the service for you. Our fastest broadband - great if you have many devices, work from home, are an avid gamer or want to stream 4K TV. For more demanding households - stream full HD content and play online games on multiple devices at the same time. Fast broadband - do more online at the same time, like watching catch-up TV and playing online games. Budget broadband - ideal for everyday web browsing, email, online shopping and banking. FibreNest is a UK-wide provider of ultrafast broadband and voice services. Part of the Persimmon Group, it delivers 100%, totally unlimited fibre-optic internet access directly into your new home, supported by great customer service. When will my service be live? We endeavour to have your service ready on the day you move in to your new home. However, occasionally factors beyond FibreNest's control can cause delays to service activation. Where this is the case, we will keep you updated with your expected go-live date and may provide you with a complimentary mobile router to ensure you have a level of connectivity until such time that your service is established. What speeds will I receive? Unlike broadband services that are delivered over copper wires (traditional broadband and fibre to the cabinet), the speed you receive is not affected by the length of the line serving your property. So, providing you're using your service fairly (see our Acceptable Use Policy), we’ll never slow your connection down - even at peak times. This means that you should consistently receive and enjoy speeds at, or very near to, the package you subscribe to. Is the service really "Totally Unlimited"? Yes. FibreNest is totally unlimited in that there is no limit to the amount of data you can upload or download in any month - although this is subject to our Acceptable Usage Policy. By agreeing to our contract and therefore our Acceptable Use Policy you agree to use your connection fairly. This essentially means you must not use the service for illegal, criminal or unethical purposes or beyond what is reasonably expected of someone using the service for domestic purposes. To protect the interests and experience of all our customers, we reserve the right to monitor high-usage connections and investigate and take action if you're downloading or uploading unusually high levels of data. Where this is identified as being the case, we may, for example, slow down certain types of activity such as peer-to-peer networking, file sharing and the downloading of very large files. Content streaming, downloading and basic browsing will never be affected. Do I need a BT telephone line in order to receive FibreNest? No. FibreNest's network is independent to BT's and you do not need a BT telephone line to receive our service. Can I keep my telephone number if I take your voice service? Of course. You can bring your existing telephone number with you, as long as your current provider allows it. Can I transfer my current service with my existing provider to my new home? 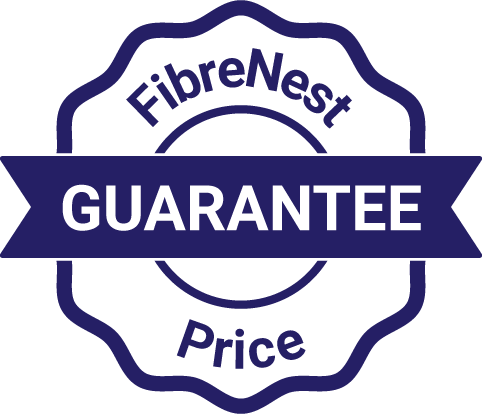 Your new home comes with FibreNest's service pre-installed as standard. Before signing up, you're welcome to check with your existing provider if they will be able to provide service at your new home. Can I keep the email address assigned to me from my existing provider? You'll need to check with your existing provider if you can continue to use your email address once you cease your service with them. You might also wish to consider moving to a free, web-based email provider such as Hotmail, Yahoo, Outlook or Gmail, as these do not require the use of a specific internet service provider. Will my current provider charge me an exit or termination fee? This depends on the contract you have with your supplier. You'll probably find this information in your agreement with them but it's probably best if you contact them to discuss. What are my options regarding television services? FibreNest does not offer its own television services although our broadband is compatible with most online content providers i.e. Sky, Netflix, YouTube, BBC iPlayer etc. BT TV is not available through FibreNest however, due to BT restricting the internet-based delivery of this to only their own broadband service. I have BT Sport and ideally would like to keep this. What can I do? Although the availability of BT TV is restricted to users of their broadband network only, the good news is that BT Sport is also available through Sky TV. This may require you to take out a separate subscription and, if you are not already a Sky customer, have its infrastructure (usually a satellite dish) installed at your property. FibreNest's residential broadband and voice services all attract a 12 month minimum term, with a 30-day rolling contract thereafter. We do not offer longer or shorter terms. How do I get my service to work? It's simple - just connect your devices to your FibreNest router, either wirelessly or with a network cable and, providing you've subscribed to one of our packages, you're ready to go. If you haven't subscribed you will automatically be redirected to our registration page where you can sign up quickly and easily. Will you need to attend my property in order to install or activate my service? No. Your service should have been fully-installed by our engineers prior to you moving in and will be ready for you to activate online. If not, or you have any problems, then please get in touch. I can't get online. I keep being directed to the FibreNest payment screen. Why? Your service has been suspended due to non-payment. Please update your payment method and pay your outstanding bill so that we can get you back online quickly. I have performed an online speed test and I am not getting the full speed I am paying for? There are many things that can affect the performance of your connection. Your connection might be a shared resource within your household and the speed any one user experiences is dependent on the number of devices online and the type of activity they are performing. You may have a number of programs running on your computer or it may have a virus or malware present which may slow its performance. If you are on one of our faster packages i.e. 500mb it is possible that your device is actually unable to communicate at these speeds. This is particularly the case with wireless connections as these are generally slower than wired. We recommend disconnecting all but one devices from your network and testing the speed using that one device, ensuring it is connected to the router with a cable and that it is actually able to communicate at the respective speed. Also, not all publically available online speed testing tools are designed or able to cope with the speeds that our full-fibre connections offer - so it is very possible that the results could be misleading. If you still believe that you are not receiving the speed you are paying for then please do get in touch. Our engineers can visit your home and test your connection with specialised test equipment but please be aware that if we attend and identify the service to be working properly, you will incur a call-out fee. Why is the router located in my living room, can I move it? Your router has been installed and is fixed in a location where the majority of customers have devices that may require a hard-wired connection to the router. For example, smart televisions, games consoles and satellite/media receivers etc. Unfortunately, your router cannot be moved. We are very sorry if this causes an inconvenience. I have taken your voice service but can't find a socket anywhere to plug in my telephone? Your telephone plugs directly into the 'Tel 1' port located at the rear of your router. You will notice that the plug on your telephone lead is different to the router's port and you should have received a free adaptor to convert it. If not, please get in touch and we'll send one out to you immediately. 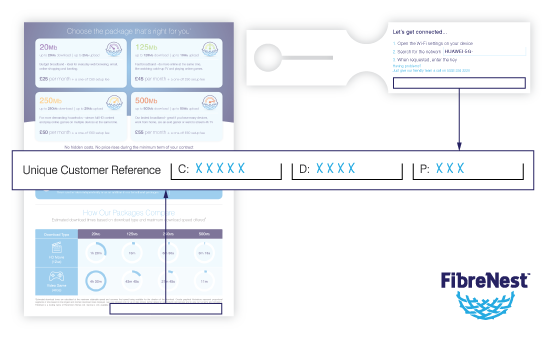 You can upgrade at any time via your online portal but if you'd like more information before deciding, our friendly Customer Support team is available to advise on the packages available and which is best for you. I’m on one of your higher speed packages. Can I downgrade to a lower speed? Of course, providing you are not within the minimum term of your contract. Once your contract comes to an end you can downgrade, no problem. The changes to your bill will take effect from the start of the next calendar month. Can I configure parental access controls on FibreNest? Your router has built-in keyword blocking which can be configured to restrict access to web addresses that contain one or more words or phrases you find inappropriate. For example, if you entered 'gambling', any web address that your child tries to access which contains that word will be blocked, for example, www.gamblinggamesonline.com. For more advanced solutions, there are many software products and services available online or in most good computer/electronics shops. When will the payment for my first bill leave my account? Your payment will be taken on the date you specified at the time of registration. Feel free to get in touch and we can let you know when this is. Why is my first bill so big? If you chose to have the one-off activation fee of £60 added to your first bill at time of registration, then this is probably why. Also, services are charged for monthly in advance, so your first bill may also include charges from the day you moved in, plus the next full calendar month's service charge. Your future bills will then reduce to your contracted amount, plus any call charges for the previous month (if you have taken our voice service). What date will payments leave my bank account? You can choose from several payment dates that suit you, making your payment convenient and predictable. Why have you taken more than my usual monthly amount? Your service charges for broadband and voice are fixed, so it’s likely to be charges for any calls you have made or additional services recently taken. Service charges are typically taken by direct debit and this is generally easiest for you. You can however, make regular or one-off payments using a debit or credit card by logging into your online portal. You can also use online banking to pay your bill via a money transfer using the following details: Barclays - Sort Code: 20-59-79 - Account Number: 03593193. Please quote your FibreNest Account Number as the payment reference. I don’t recognise a particular phone number on my bill for call charges made? Only telephones physically connected to your router can initiate calls, so it was most likely another household member or visitor that made the call. If you still feel this is not possible then please get in touch. I am moving house and leaving a FibreNest-enabled property. Can I take my service to my new address? If you are planning to move home please contact us to see if FibreNest is available at your new location. If so, we can transfer your service free of charge. If not, you will need to contact a different provider in order to receive service. If you are outside of your 12 month minimum term with us, we require 30 days' notice in writing from the account holder and details of your forwarding address. With exceptional customer service delivered from UK call centres, we’re ready to give you the help and advice you need.